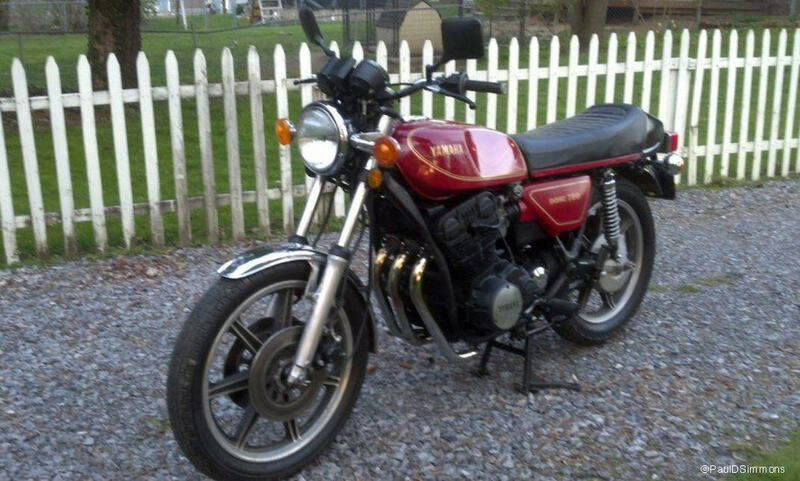 The first time I saw photos of Paul Simmons’ current motorcycles, I was captivated by the images of this 1978 Yamaha XS750 Triple, which is one of five running motorcycles he owns. I wanted to go over to his place, fire the bike up, and “test” ride it. Unfortunately for me, I live in Southern California and Paul lives in Geneseo, New York, and my teleportation device is not working properly, so I couldn’t just “pop” into his garage with my leathers on and helmet in hand. The Yamaha Triple was the most technically innovative bike of the time and was proclaimed the “Bike of the Year” for 1977 by the motorcycle press. The 750 had a 120 degree three cylinder crank, dual overhead cams, 3 carburetors, shaft drive, triple disc brakes, and solid alloy wheels. The Triple is a beauty in my eyes. I’ll let Paul, shown below, talk about it in his words: “I have not yet licensed the 750. I went over it and installed a K&N air filter, changed all the fluids, cleaned, and touched it up. It has a dent in the top of the tank that I need to do something about. It also has a MAC 3-1 exhaust that sounds very nice! 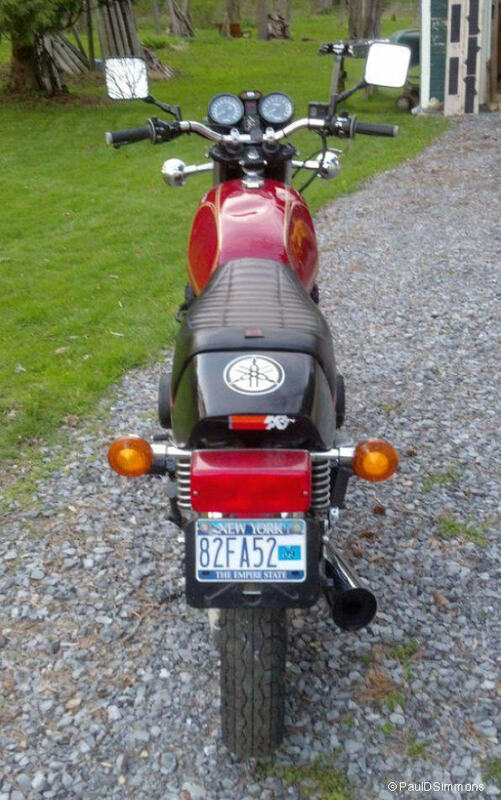 I bought it just before I found the FZ, so it got placed on the back burner for a while. Paul is the Workout Center Director at SUNY Geneseo and also works part time as an Athletic Trainer at a local High School. The photos in this post were taken with his phone. 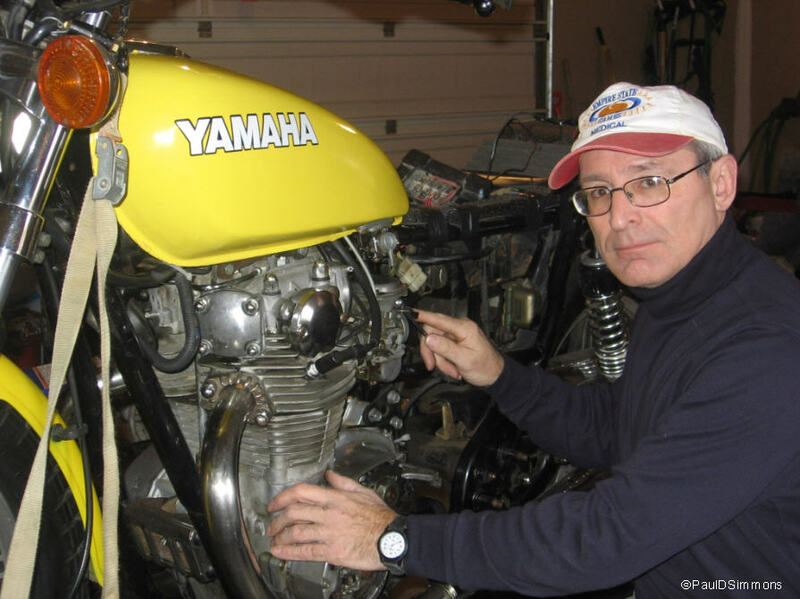 He is shown here wrenching on the Yamaha 650 street tracker. 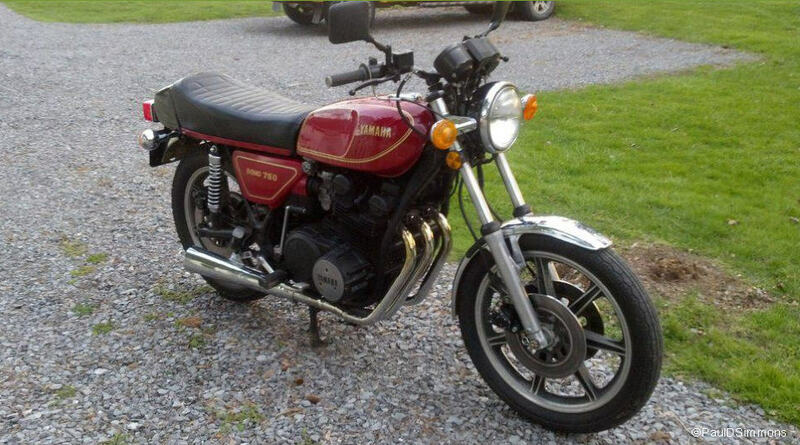 He also owns the FZ1 mentioned above, a restored 1986 Yamaha 600 Radian, a Suzuki DR, and an “old Yamaha 650 twin” that he built as a street tracker. 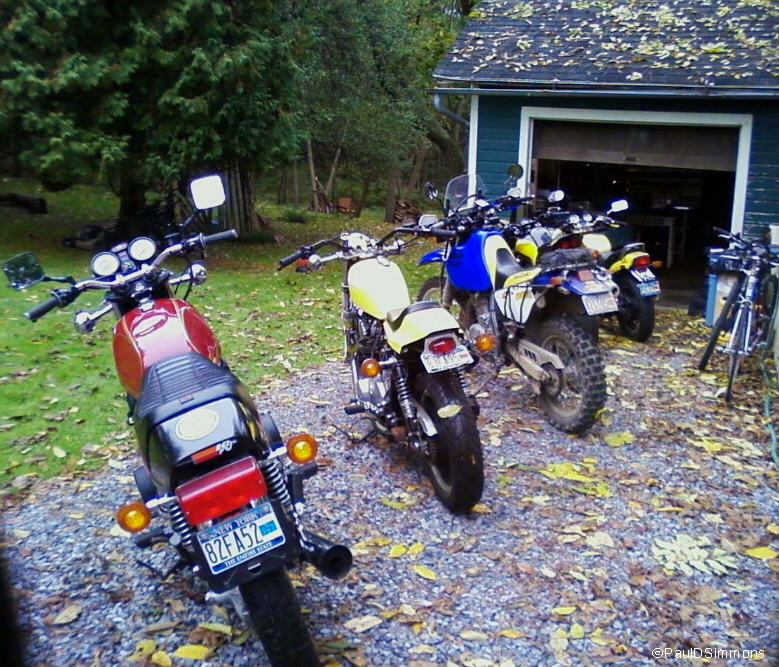 In addition, he has a garage “full of Yamaha 650 twins”, but the street tracker is currently the only “runner”. The photo shown here is of the running bikes and the garage that they are stored in. It looks like they won’t all fit in the garage, but that is the deceptive result of the perspective of the photograph.